Sky News is installing Twitter software across its journalists' computers, as part of plans to encourage more use of social media for newsgathering and reporting. The TweetDeck application, which allows users to browse multiple Twitter accounts or searches, will be on all staff machines within a month, Julian March, executive producer, Sky News Online, told Journalism.co.uk. The introduction of the new software marks a sea change for the online team, which appointed Ruth Barnett as social media or "Twitter correspondent" in March 2009. Barnett will now move to Sky's Westminster bureau. "The big change for us in 2010 is evolving how social media plays a role in our journalism. We no longer ghettoise it to one person, but are in the process of embedding throughout the whole team," said March, adding that since the appointment of a Twitter correspondent more than 90 Sky staff now have Twitter accounts, from field producers to weather presenters. "Ruth told me she thought one of her tasks as social media correspondent was to make the role extinct - to encourage all journalists in the team to use these tools and not make it the responsibility of one individual." 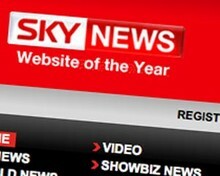 Twitter has also been influential in recent changes to Sky News Online's breaking news strategy. The Sky News account detects when new stories are published online and broadcasts them via Twitter; while the recently launched @skynewsbreak account offers exclusivity for a social media audience, tweeting breaking news stories before they appear on the website. The system will eventually be reversed with @skynewsbreak feeding a breaking news strap across the broadcaster's website, March said. Twitter isn't the only social media tool used by Sky journalists, but its versatility from mobile reporting to powering liveblogging, such as this week's information blog on the heavy snowfall in the UK, make it a must for the team, he explained. "There aren't so many users as Facebook, but they are deeply engaged and it can be applied in so many ways," added March. Facebook Connect integration for the website ahead of this year's general election is on March's wishlist however. The site will also ramp up its use of liveblogging to bring together conversations and news from social media sites with reports from Sky News' other platforms. Experiments such as the recent streaming of tweets from Sky News' foreign affairs editor Tim Marshall across TV footage of the Iraq inquiry will also be developed, said March. "[But] we have to be wary of crossing platforms too much. Great telly isn't made by throwing great web stuff on it. We have to be aware of the strengths of each platform. That's why Sky News can maintain brand unity, while doing different things on different platforms," said March. "What you have to do is understand what landscape you’re operating in. Just like any type of journalism you have to make sure you use the tools available to do the best job you can."